Holding the gas powered post hole digger we rented for the afternoon. A few years ago we had a big wind storm and it blew done a few panels of our old cedar fence. I purchased new cedar panels and 4×4 fence posts. I used a clam shell post hole digger to dig the post holes. It worked fine, but I was happy that I only had to dig a few fence post holes. If you are only digging a few holes, I can recommend using this tool. If you are digging more than that I recommend you get something with a bit of power. Last summer I helped a friend build his deck and the project called for a lot of posts. I was really happy when he rented the gas powered post hole digger in the picture above. It took two of us to run it and we sweated a bit, but it was a lot quicker than using the clam shell tool. Using this powered version we were able to dig all of the post holes in an afternoon. Here’s the video I created of how to use a post hole digger. 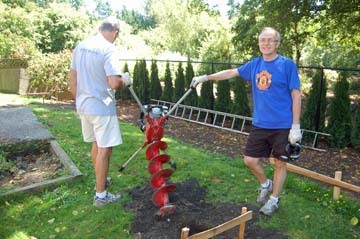 The first thing I learned, is that you want to keep the auger clean of dirt and debris. We found that the best way to do this is to move the post digger up and down as it is running. This pulls the dirt out of the hole and it will automatically spread the dirt at the top of the hole. The second thing I learned, is that if you are working in an area with large rocks, the auger may not have enough power or the space to remove them. In this case you need to stop the post hole digger, pull it out of the hole and remove rocks by hand or using a shovel. If you have any questions or informationon digging post holes that you would like to share, please leave a comment below. I did the same thing! There was a little area of our yard that I wanted my dog to stay out of, so I used a clam shell post hole digger to dig out a few holes for a small fence. We liked the look of it so much that we are now planning to add a matching fence around our whole property. I’ll use an electric pole digger for this job.